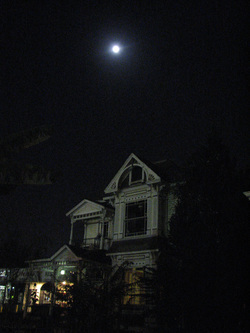 One time home to Horace B. Dibble, HM157 in Lincoln Heights was transformed into a house of pure evil October 31st, 2010 for the City of Lincoln Heights Halloween Celebration. Horace B. Dibble, the salesman whose name is associated with this very old Queen Anne home in Lincoln Heights, stabbed to death a shipping clerk back in the 1890s. It was during the hour of 7:00 a.m. on June 18, 1896, when Dibble, about forty years old, went to his job at the Pacific Crockery and Tinware Company at 226 North Los Angeles Street downtown where he worked as a salesman. A heated argument broke out between him and a co-worker, shipping clerk James Wallace. Wallace, according to the Los Angeles Times account, growled “he had a good mind to jump all over Dibble’s frame because he had given the wrong address for the delivery of a bill of goods.” After being proven wrong, Wallace was so worked up that he grabbed a hammer and went looking for Dibble, but eventually cooled down. Dibble left the shop, but returned to polish his shoes. To guard against another outburst from Wallace, he grabbed a knife from a nearby sample case. Dibble then approached Wallace, called him a coward, and “a vile epithet” all the while concealing the knife. Wallace, whose “eyes were sparkling like those of a demon,” then came after Dibble who plunged the six-inch blade three times into Wallace’s side, “clear to the hilt.” Wallace’s last words were, “Dibble has cut me all to pieces.” Wallace left behind a widow and child in Chicago. Dibble promptly replaced the (now blood-covered) knife in its sample case. Later that October, Dibble – was discharged after yet another witness testified to Wallace’s being a notorious hothead. The June L.A. Times account of the murder reported Dibble had lived in Los Angeles for nearly twenty-five years and “is well known and very popular, and lives with his wife at No. 110 Downey avenue.” That section of Broadway was known as Downey until 1910. Four years later, George S. Safford sold the lot in block 22, East Los Angeles, to H.B. Dibble for $1,750. Nightmare Tony has collected number of large props from The Haunted Vineyard and other popular haunted attractions which he proudly displays at his Nightmare Park. Through his dedication and hard work Tony is keeping the spirit of The Haunted Vineyard alive! He has added his own touch of magic creating scenes like this one featuring the queue line Hearse from The Haunted Vineyard with Tony's ghost horse!